With over 4.20 lakh units sold in the six years of its lifespan, the first generation Maruti Ertiga is a household name in the sub-INR 10 lakh segment. Last month, the carmaker launched the second generation of its only MPV. The new model is based on the HEARTECT platform and features the K15B 1.5-litre petrol engine with SHVS mild-hybrid technology. Moreover, it benefits from a substantial increase in areas such as the overall dimensions, fuel efficiency, performance, and equipment. 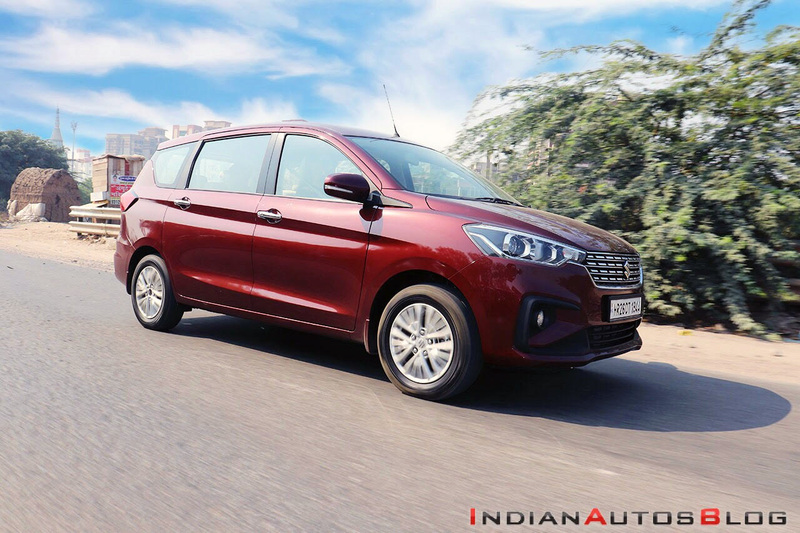 Our 2018 Maruti Ertiga test drive review walks you through all there's to know about the new model. With the first-gen Ertiga clocking a sale of 4.20 lakh units, the new version has some big shoes to fill. The 2018 Maruti Ertiga is 99 mm longer, 40 mm wider, and 5 mm taller than the earlier iteration. It sports a contemporary design that makes the new model look fresher and more upmarket than the outgoing version. That said, in spite of not sharing even an inch of sheet metal with the earlier version, the overall aesthetics have a glimpse of the previous generation. The front-end is characterised by a pair of sleek headlamps that carry projector units, a well-chiselled bumper with bold C-shaped foglamp housings, and dollops of chrome on the front grille. It's the new model's side profile that manages to establish a connection with the earlier version. The large greenhouse, particularly the extra-long rear window, is quick to remind you of the predecessor. The new multi-spoke alloy wheels look reasonably stylish, while the floating roof-type design owing to the blacked-out D-pillar adds a bit of sophistication. The major highlight of the posterior is the very Volvo-ish set of L-shaped LED tail lights. Overall, the 2018 Maruti Ertiga looks every bit more special than the car it replaces but reminds you of its predecessor when viewed from certain angles. A couple of glaring omissions, however, include the LED DRLs and machined alloy wheels. Akin to the exterior, the interior of the 2018 Maruti Ertiga is bigger and feels more upmarket. While various bits from the Maruti parts bin, such as the steering wheel, Smartplay touchscreen infotainment system, and many buttons and knobs, remind you of other models in the company's lineup, the Audi-inspired dashboard, with faux air-vents running across its breadth, gives a distinct identity to the cabin. The dashboard itself is divided into two by faux wood trim, which further adds to the premium look. The flat-bottom steering wheel comes from the Dzire, while the large colour TFT multi-information display will remind you of the Ciaz. 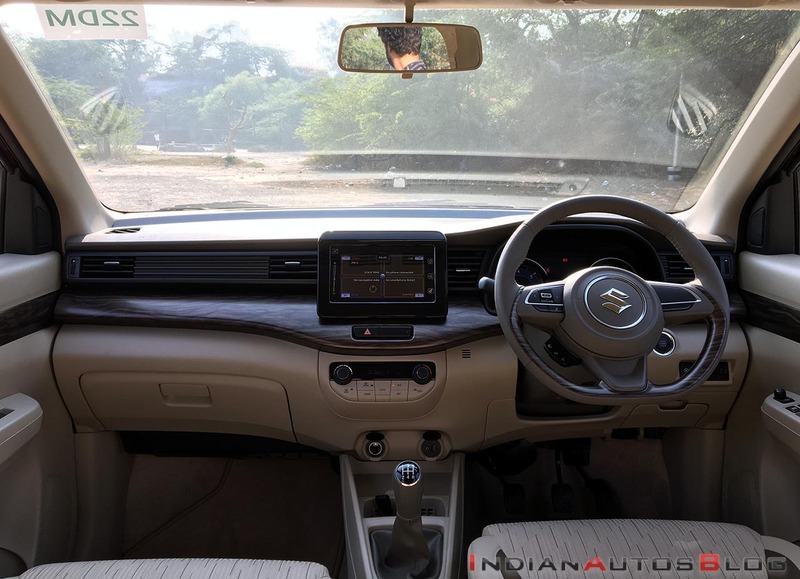 On the inside, the 2018 Maruti Ertiga feels more upmarket than its earlier version, which is owing to more sophisticated dashboard design, more features, and better plastics. The front seats feel sufficiently supportive and keep the occupants comfortable even on the long drives. The sliding front armrest makes things even better, but the tiny storage compartment under it won't hold anything more than a set of keys or some loose change. Thankfully, the storage compartment below the USB/Aux-in port can comfortably accommodate a large-size smartphone. Other practical touches include cooled cupholders for front passengers, a 1-litre bottle holder in every door pad, and a 12V DC charging socket in each row. 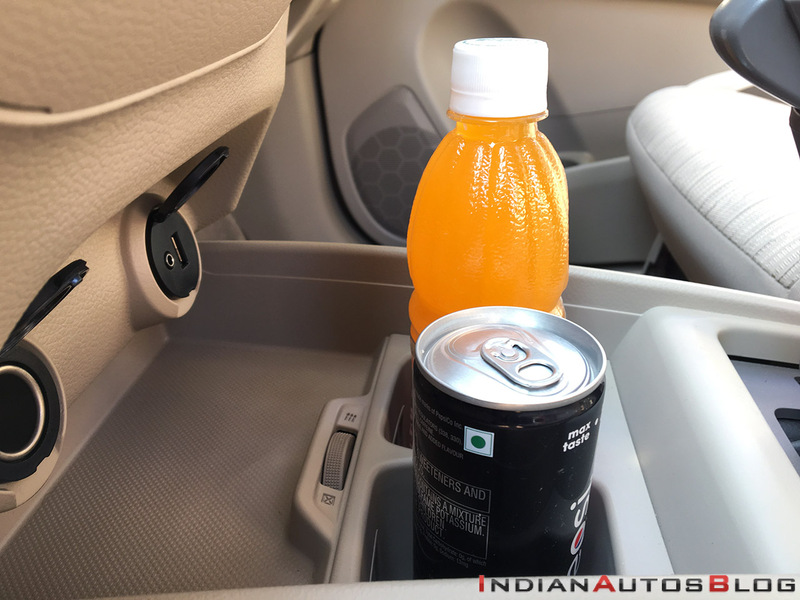 The set of cooled cup-holders on the 2018 Maruti Ertiga is a segment-first feature. The earlier Ertiga won plenty of accolades for the spacious second-row of seats and things only improve with the advent of the new generation model. The middle-row seats offer a 40:60 split and can be moved forward for easy access to the third row of seats. Unlike the previous generation, which provided a cramped third row of seats, the new version has enough space to keep two adults comfortable over short journeys. Furthermore, the large quarter glass ensures the occupants never feel cramped or claustrophobic. The passengers also benefit from a recline feature and roof-mounted aircon vents. With the three rows of seats in place, there's a boot space of 209-litres, which can hold four medium-sized bags, at best. Folding down the third and second rows of seats, however, expands the luggage capacity to 803-litres. The 2018 Maruti Ertiga features the new K15B 1.5-litre four-cylinder naturally-aspirated petrol engine instead of the K14B 1.4-litre motor that powers the outgoing generation. With a maximum power of 104.5 PS and a peak torque of 138 Nm, the new powerplant is significantly more potent. The increase in power is evident from the word go, with the MPV feeling sprightlier in the low- and mid-range engine speeds. Things, however, get a bit lacklustre post 4,800 rpm, with the power surge tapering off and the engine getting vocal without delivering strong top-end performance to complement the sound increment. That said, the motor is capable of spinning till 6,200 rpm, but overtaking fast moving traffic often needs a gearshift. 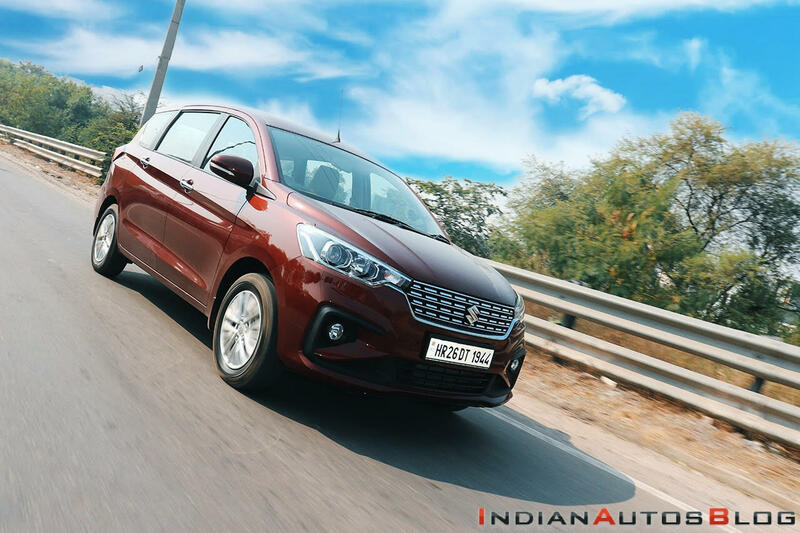 While the new K15B petrol engine makes the Ertiga more potent than the earlier version, it's still not an exciting performer due to the lacklustre top-end performance. The 5-speed manual transmission is a smooth shifting unit and offers a light clutch, but the 4-speed torque-converter automatic is a lazy performer. Moreover, there's no manual mode, which means you're mostly at the mercy of the electronics. There's a button on the side of the gear knob for the 'Overdrive Off' mode, which keeps the transmission in the first three gears only. You can also keep the vehicle in lowest gear by selecting the 'Low' mode. The '2' mode keeps the second gear engaged. The new engine is as smooth and refined. In spite of an increase in the displacement and the performance figures, the bigger motor is more fuel efficient. This is also due to the marginally lower kerb weight and the dual-battery SHVS technology that works seamlessly behind the curtains. Going by the ARAI certification, it's capable of offering as much as 19.34 km/l with the 5-speed manual transmission and 18.69 km/l with the 4-speed automatic unit. Thanks to the HEARTECT architecture, the 2018 Maruti Ertiga offers a great amalgam of high ride quality and decent handling characteristics. While you don't get the proverbial 'magic carpet' ride, which is due to some underlying stiffness, it does iron out most of the undulations to a large extent. We drove the new MPV over various broken patches, and none of the passengers complained of the jolts transferring into the cabin. Thanks to the usage of the HEARTECT platform, the 2018 Maruti Ertiga offers a fantastic ride quality along with predictable handling characteristics. The steering is a bit light, which is a great thing at parking speeds and even when making your way through a traffic-infested street. On the highway, however, it isn't exactly confidence-inspiring. There's a slight body roll while changing directions at high speeds but things never get unnerving. Also, unlike the earlier generation, the new model feels more planted. There's sufficient grip from the 185/65 R15-spec Bridgestone Ecopia tires. The brakes are powerful and are capable enough to haul down this MPV from high speeds without breaking into a sweat. 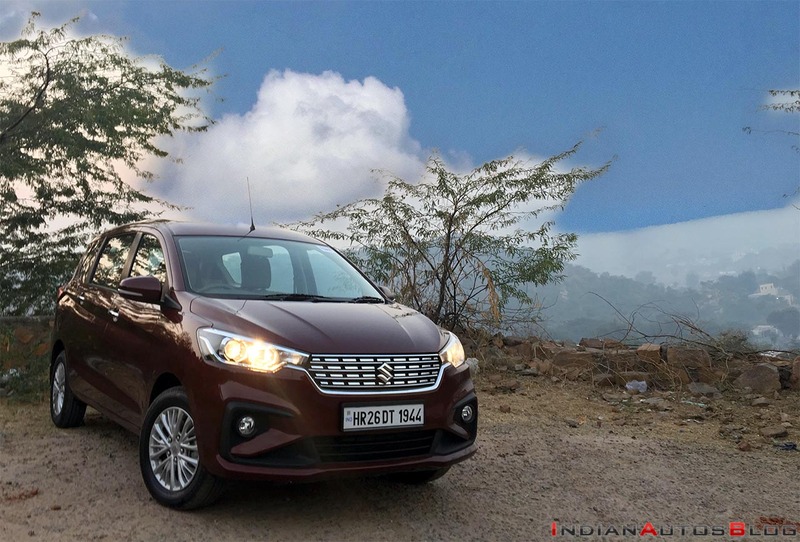 On sale in a price bracket of INR 7.44 lakh to 10.90 lakh, the 2018 Maruti Ertiga is more than a lakh costlier than its earlier iteration. This increment, however, is entirely justifiable. The new model retains most of the qualities of its predecessor while improving in almost all key areas. It looks fresher and offers a more spacious and upmarket cabin. The K15B petrol engine is more powerful and even provides a higher fuel efficiency. Plus, the usage of HEARTECT platform has led to an improvement in the ride quality as well as the handling characteristics. Hence, in spite of the price increment, the second-gen Ertiga comes across as a better VFM proposition.